Siren Maniacs - Design, Creatures, etc. 06 & 07 - Detailing the shibito (shibito Risa went through quite a few stages). You can also see that Shibito Takato, nicknamed "kuchibiruge", was designed based on a combination of goosefish and catfish. 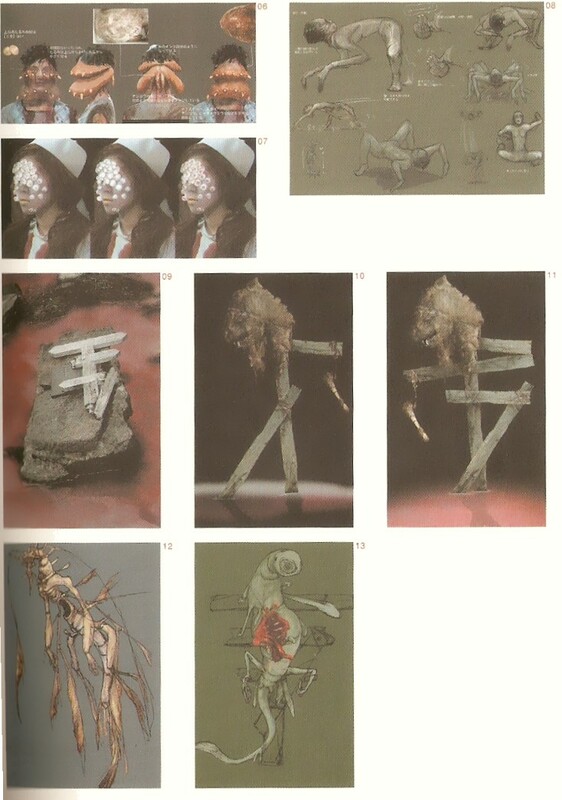 08 - Spider shibito during different stages of concept drawings. The inside-out spider shibito were designed at this point to crawl on all fours. 09, 10 & 11 - Practicing the Mana cross design. 12 - The incomplete Datatsushi. 13 - Juvenile Datatsushi with his stomach eaten away. The open mouth has a quite vivid impression.